The vineyards of Domaine Saint Sylvestre are in several different parcels. 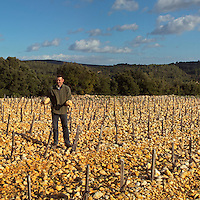 Some is on an amazingly barren and stony soil, similar to the galets roulés in Châteauneuf-du-Pape, only with even bigger rocks. This is called the défriche de rouge and was cleared to plant vines in the early 2000s. Other vineyards have clay and limestone soil. The vineyards are planted with syrah, grenache and mourvèdre grapes. There is also some white grape varieties: chardonnay, roussanne, marsanne, and viognier. Care is taken to limit the yields in the vineyard and no more than 15-20 hl/ha is produced. The vinification is traditional, with each grape variety fermented separately. Natural yeast is left to do its work for the fermentation; extraction of aromas from the grape must is helped with some punching down and some pumping over. The wine also gets some aging in oak barrel. Writing this in early 2012 the Domaine Saint Sylvestre has not yet released any wines in bottle.